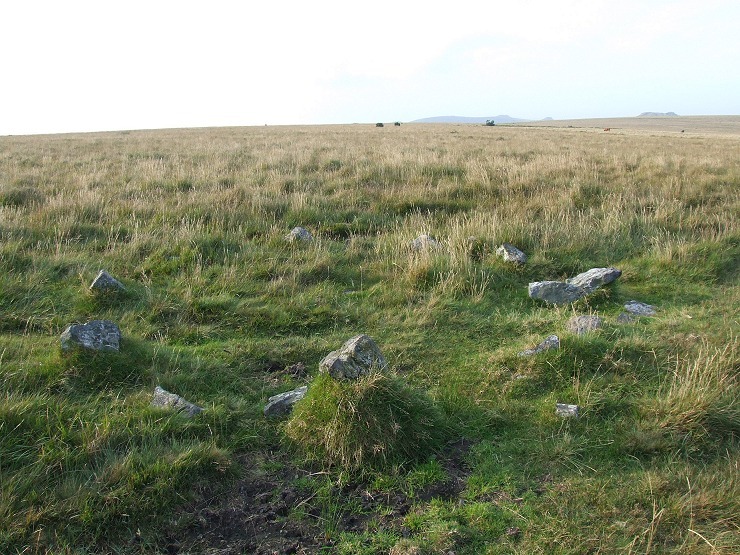 This is a small but suspiciously well preserved circle of stones that may be the retaining kerb of a robbed cairn, located to the southwestern side of Ringmoor Down it forms part of a line of cairns that occupy this part of the moor. Standing just 200 metres west of Ringmoor Stone Row and 550 metres northwest of Brisworthy Stone Circle it consists of between 14 to 20 low boulders and stones which are said to be of a form of quartz that although not uncommon on Dartmoor is said to be unusual for the the building of prehistoric monuments in the area. Any trace of the central cairn has disappeared but there is a slight ditch around the stones and due to their small size and portability it is surprising that they have survived at all, indeed there is suspicion that they may be fairly modern or at least a reconstruction, possibly carried out by Reverend Sabine Baring-Gould who 'restored' the Ringmoor row and its associated cairn circle in a rather dubious manner. Suggested Date: Bronze Age or modern reconstruction.